Alloantibodies to HLA class I or II and other antigens expressed by endothelium cause a variety of effects on renal transplants, ranging from acute to chronic rejection, and even apparent graft acceptance (accommodation). Recognition of these conditions and appropriate therapy requires demonstration of C4d in biopsies, commonly confirmed by tests for circulating alloantibody. Substantial practical experience by pathologists in the interpretation and pitfalls of C4d stains are reviewed along with considerations of the clinical significance and pathologic mechanisms of the different effects of antibody on the endothelium of the renal allograft. Clinical trials will be needed to ascertain the optimal treatment for the newly appreciated conditions chronic humoral rejection and accommodation. Alloantibodies are now appreciated as important mediators of acute and chronic rejection, differing in pathogenesis, or “nature,” from T cell–mediated rejection. Alloantibodies preferentially attack a different “location,” namely the peritubular and glomerular capillaries, in contrast to T cells, which characteristically infiltrate tubules and arterial endothelium. Antibody-mediated rejection generally has a worse prognosis and requires a different form of therapy than the usual T cell–mediated acute rejection. Recognition of the clinical relevance of alloantibodies, beyond their historical role as mediators of hyperacute rejection, has rested on a new diagnostic technique (C4d) that permits a definitive diagnosis of antibody-mediated rejection in a renal biopsy the pioneering studies of Feucht et al. (1) in Munich showed that peritubular capillary (PTC) C4d deposition in renal transplant biopsies is strongly associated with a poor prognosis and raised the possibility that antibodies were responsible. Connection among the renal pathology, C4d deposition, and circulating donor-specific antibodies (2–4) clenched the evidence for acute antibody-mediated rejection, which is now widely accepted as a distinct clinicopathologic entity (5). C4d is a fragment of C4b, an activation product of the classic complement pathway (Figure 1). C4b (and C4d) contain an occult sulfhydryl group that forms a covalent, thioester bond with nearby proteins on activation by antibody and C1 (6). C4b/C4d remains bound in the tissue after Ig and C1 have been released for several days (6). No functional role of C4d per se has been reported. C4d deposition is strongly associated with circulating antibody to donor HLA class I or class II antigens (2,7,8) and is currently the best single marker of complement-fixing circulating antibodies to the endothelium. 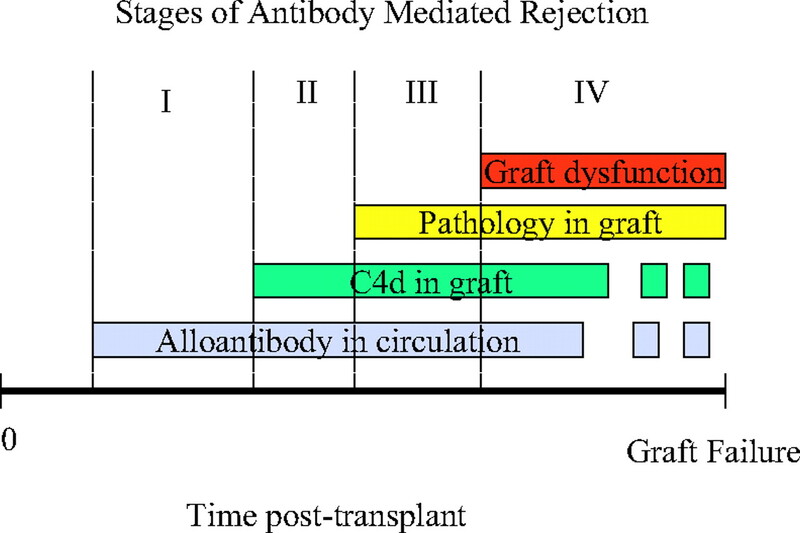 In the past decade, four forms of antibody-mediated graft injury have been defined (Table 1) (6,9–11). We review current concepts of these four conditions, the interpretation of C4d staining, and the biologic effects of antibody on the endothelium, all areas in which knowledge is evolving rapidly. The diagnostic criteria for acute humoral rejection (AHR; acute antibody-mediated rejection) are given in Table 2. Patients with AHR present with an acute loss of graft function that often arises in the first few weeks after transplantation and cannot be distinguished from cell-mediated rejection on clinical grounds (4,11,12). AHR can also develop years after transplantation, often triggered by a decrease in immunosuppression (iatrogenic, noncompliance, or malabsorption). Presensitization is the major risk factor, but most of the patients with AHR had a negative cross-match. AHR has occurred with all immunosuppression regimens, even profoundly depleting therapy (13). The first clue that circulating anti–class I HLA antibody caused a different pattern of acute rejection came from the studies of Halloran's group in Edmonton (12). These investigators showed that neutrophils in PTC and glomerular capillaries are strongly associated with circulating anti-donor HLA antibodies. Other features, such as fibrinoid necrosis of arteries and microthrombi, are also more common. However, none of these features is specific (i.e., occurred only with circulating antibodies). The pathology of AHR has a wide spectrum and can easily be missed by histologic criteria alone. Renal biopsies may show acute cellular rejection, acute tubular injury, or thrombotic microangiopathy (Figure 2). Neutrophils in capillaries are characteristically but not always found. Macrophages are now recognized as a common intracapillary cell in AHR in kidney (14) and heart (15) allografts. Typically, the PTC are dilated. Fibrinoid necrosis is found in a minority of cases (approximately 10 to 20%). A component of acute cellular rejection may also be present, as manifested by a prominent mononuclear infiltrate, tubulitis, or endarteritis. These lesions are generally not attributable to antibody alone. Treg cells (FOXP3+) are rarer in the infiltrate than in cell-mediated rejection, perhaps contributing to the poorer prognosis in AHR (16). Microthrombi and interstitial hemorrhage also sometimes occur. The PTC and glomerular endothelium shows a variety of ultrastructural changes, including loss of fenestrations, detachment from the basement membrane, lysis, and apoptosis; complete destruction of capillaries can occur, leaving thickened laminated basement membranes (17). Immunofluorescence (IF) curiously does not often show antibody or C3 deposition in the vessels. However, IF does show C4d in the majority of the PTC as a bright ring pattern, using a mAb in cryostat sections (2–4). Immunohistochemistry (IHC) works in formalin-fixed, paraffin-embedded tissues with a polyclonal antibody (13). By immunoelectron microscopy, C4d is detected on the surface of the endothelial cells and in intracytoplasmic vesicles (18). Antibodies that react to non-C4d portions of the C4 molecule do not show PTC deposition, arguing that what is detected in tissues is primarily C4d (19). Antibodies to donor HLA class I or II antigens are present in 88 to 95% of the patients who have C4d deposition and acute graft dysfunction versus less than 10% in C4d-negative acute rejection (2,7,8). Antibodies to donor ABO antigens show a similar association. C4d deposition without detectable circulating antibody can be due to absorption by the graft, as demonstrated by elution of anti-HLA antibodies from rejected grafts in patients who had no detectable circulating antibody at the time, even from needle biopsies (20). Non-HLA, non-ABO antigens are the target in a minority of cases, probably accounting for the rare C4d+ acute rejection in HLA-identical grafts (<2% of patients) (21). Autoantibodies to the angiotensin II type 1 receptor have also been associated with graft loss and fibrinoid necrosis that resembles alloantibody-mediated rejection except for the common absence of PTC C4d (22). Lack of C4d deposition in protocol biopsies in the presence of circulating donor-reactive antibody has been observed using flow cytometric assays and donor cells (7,8), perhaps in part because of antibodies of too low avidity or inability to fix complement. Fc receptors on NK cells (FcRIIA) may also play a role in acute rejection, and it is possible that some examples of AHR in biopsies that lack C4d are due to this mechanism. The Banff schema defines positive C4d by IF as “widespread, strong linear circumferential PTC staining in cortex or medulla, excluding scar or necrotic areas” (9). This pattern has been associated with circulating alloantibodies. Many have taken 50% of the capillaries as the threshold. The dilemma has been what to do with those not uncommon cases with focally positive PTC that do not exceed 50%. In one study, Meehan and colleagues (23) found that diffuse C4d (≥50% of PTC) had a higher rate of graft loss 1 yr later (65%) than those with focal or no C4d (33% graft loss in both cases). In contrast, Magil and Tinckam (24) found that the outcome with diffuse or focal C4d was not distinguishable and was worse than those without C4d. Similarly, C4d staining of ≥25% of the PTC by IHC was associated with decreased 1-yr graft survival (13). More of the focal C4d cases had acute cellular rejection (93%) than did those with diffuse C4d (35%), suggesting that for C4d to be solely responsible for graft dysfunction, diffuse deposition is required (24). Alternatively, cellular rejection may interfere with C4d accumulation. The sensitivity of the C4d technique contributes to the extent observed. Decreased sensitivity and increased intra- and interobserver variability have been reported for paraffin-IHC methods compared with frozen-IF (19). Of 26 cases that were diffusely positive by IF, 8% were minimally stained by IHC (three to 10 PTC total) and would be considered negative. Of those that were focally positive by IF, 52% were completely negative by IHC. The variability between observers (κ statistic) decreased from 0.9 to 0.6 for IHC. Similarly in another study, three of 15 of the diffusely positive cases by IF were only focally positive by IHC, and one of the five that were focally positive by IF became negative by IHC (25). IHC also has artifacts, such as staining of the plasma in the capillaries and interstitium as a result of fixation of soluble C4, which can render the sample uninterpretable. In one series, 8% of the samples showed this artifact, which was alleviated by decreasing the microwave treatment time (23). However, IHC in fixed tissue has a great advantage over IF: Glomerular deposits can be assessed, because the normal mesangium does not stain for C4d in fixed tissue but does in frozen. Among the frozen-IF techniques, the triple-layer method is the most sensitive (4); for example, 50% of cases that were focally positive by double layer become diffusely positive by triple layer (25). False-negative C4d staining is found in areas of necrosis, and care must be taken in some cases to find areas of viable tissue, most easily done in fixed sections. Medulla is adequate for interpretation, because medullary capillaries also are targets of C4d. The tubules of the medulla may be confused capillaries, especially in frozen tissue. Arteries and arterioles not uncommonly have C4d, even in native kidneys with vascular disease. The reason is unknown, perhaps because of autoantibody or nonantibody complement activation. 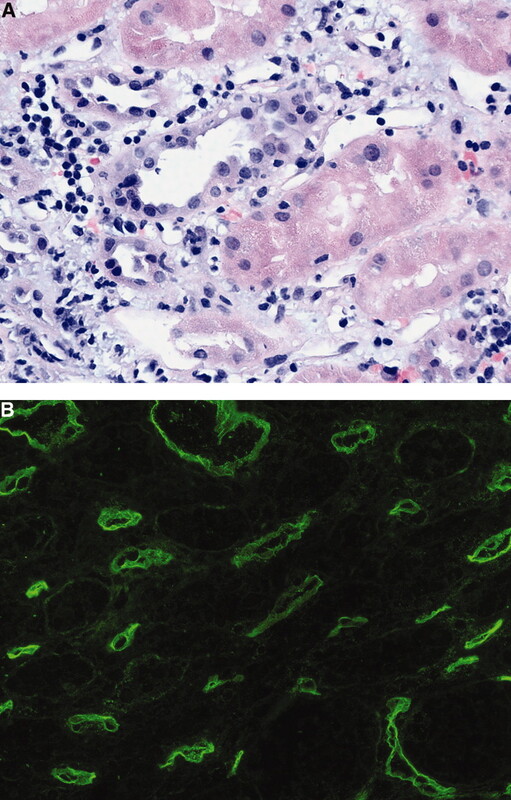 C4d deposition in PTC is found in only a few instances of renal disease in native kidneys. Lupus nephritis may have bright, granular deposits along the PTC, corresponding to the immune complex deposits (6). One case of endocarditis was described with PTC deposits. Acute tubular necrosis does not generally show C4d in PTC, even in kidneys from non–heart-beating donors (6). Thrombotic microangiopathy is negative for C4d in PTC, as shown in five published cases of recurrent hemolytic uremic syndrome in a transplant (26), as well as unpublished experiences (9). This is particularly helpful, because AHR is always in the differential diagnosis of thrombotic microangiopathy. Thrombosis of the major renal vessels can lead to graft pathology that resembles AHR; however, no fibrinoid necrosis of arteries or C4d deposition in capillaries occurs. Glomerular C4d staining is commonly present in glomerular immune complex diseases and is not specific. C3 is the next component in the classic pathway sequence after C4; therefore, its cleavage products should indicate more complete complement activation (Figure 1). C3d (or C3c) was found in PTC in 39 to 60% of biopsies from HLA-mismatched grafts with diffuse PTC C4d (8,27–29). In general C3d and C4d were correlated. However, in one report, 19% of those with C3d had no C4d (28). This finding may be related to C3 activation via the alternative pathway, independent of C4. In the most comprehensive study, C3d was found only in conjunction with C4d in sensitized patients (8). Neutrophils in PTC or features of thrombotic microangiopathy correlated with C3d deposition in one study (8) but not in two others (8,29). The pathologic features of C3d+C4d+ biopsies were similar to those with C3d−C4d+ cases in ABO-compatible grafts (8). The presence of C3d was associated with increased risk for graft loss, compared with C3d− cases, but C3d provided no convincing additional risk compared with C4d+. Macrophages in glomeruli correlated with C3c and C4d in glomeruli, which had a worse prognosis than C4d alone (30). The interpretation of C3d is complicated by the common presence of C3d along the tubular basement membrane, commented on by Haas et al. (8). They concluded that C3d added little diagnostic value to C4d in positive cross-match grafts that showed histologic features of AHR (8). Similarly, Herman et al. (29) found that, in contrast to C4d, C3d was not associated with neutrophils in PTC, donor-reactive antibodies, or outcome. Therefore, at this time, no strong argument can be made for including C3d in the panel for ABO-compatible grafts. Other complement components, such as C1q and C5b-9 (membrane attack complex [MAC]) are not conspicuous in PTC in acute rejection. MAC deposits in tubular basement membranes, rather than PTC (31), perhaps because of the expression of the inhibitor of MAC formation, CD59 in PTC. 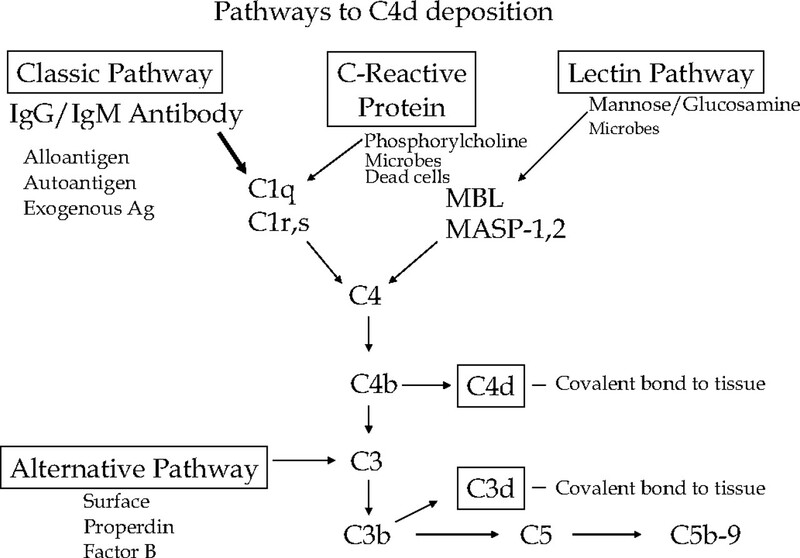 Lectin pathway components (Figure 1), which activate C4 by binding to microbial carbohydrates, are sometimes detected in conjunction with C4d. Mannose-binding lectin-associated serine protease-1 (MASP-1) was present in one of 11 protocol biopsies with C4d; no mannose-binding lectin was detected (27). Among 18 biopsies with C4d, 16 had diffuse H-ficolin along the PTC, whereas none of the 42 cases without C4d had H-ficolin. No MASP-1 or MASP-2 was detectable (32). The significance of these observations is not clear, because MASP proteins are required to activate C4 via the ficolins or mannose-binding lectin. C-reactive protein can also activate C4 but generally does not lead to full complement pathway activation (6). AHR requires different therapy than cell-mediated rejection. Therapy for AHR is plasmapheresis and intravenous Ig combined with intense immunosuppression (typically tacrolimus and mycophenolate mofetil). The use of these agents is empirical, because it is difficult to justify a randomized, controlled trial that leaves out any of these components. Immunoabsorption with protein A was tested in a randomized trial and reversed AHR in five of five cases, whereas four of five without early immunoabsorption lost their graft (33). For those that fail this treatment, other measures include anti-CD20 (rituximab) and splenectomy. Anti-complement (anti-C5) and inhibitors of plasma cell and B cell growth/survival (transmembrane activator and cyclophilin ligand interactor Ig) also deserve evaluation. The pathology of hyperacute rejection overlaps completely with AHR. Hyperacute rejection, by definition, arises within minutes or hours in presensitized patients who have circulating HLA, ABO, or other alloantibody-to-donor endothelial surface antigens (9). Deposition of C4d occurs in PTC and glomeruli, just as in AHR. However, early biopsies may be negative for C4d, presumably because of lack of access of C4 to the site (vasoconstriction) or enough time for sufficient amount to be deposited. Furthermore, early biopsies may be C4d+ without hyperacute rejection. Some presensitized patients with low titers of antibodies show C4d deposition in the capillaries immediately after reperfusion but without development of hyperacute rejection (34). Two such patients later developed AHR (5 to 35 d later). Finally, a few cases with hyperacute rejection have fibrinoid necrosis of arteries and no C4d deposition (or circulating anti-donor antibodies). The nature of this process is unknown but may involve antibody reacting to non-HLA antigens. In the past 5 years, evidence has accumulated that argues for a significant role of alloantibodies to MHC antigens in the pathogenesis of slowly progressive graft injury and dysfunction. Several studies have shown that circulating anti-HLA class I or II antibodies, either donor reactive (35,36) or de novo, non–donor reactive (36,37), are found in a substantial fraction of renal allograft recipients, and these are associated with later graft loss. Among 2278 recipients who were followed prospectively, graft failure 1 yr later was greater in those with alloantibodies than in those without (8.6 versus 3.0%; P < 0.0001). Increased risk for graft loss mainly affected those with intermediate graft dysfunction at the time of the antibody measurement (creatinine 2.0 to 3.9 mg/dl) (37). Antibodies to MICA (a polymorphic class I–related antigen) are also associated with late graft failure, even in the absence of measurable HLA antibodies (38). Transplant glomerulopathy and arteriopathy are the pathologic features that usually are attributed to alloimmune mechanisms (9) (Figure 3). Transplant glomerulopathy is defined as widespread duplication or multilamination of the glomerular basement membrane (GBM), sometimes accompanied by mesangial expansion and accumulation of mononuclear cells in glomerular capillaries. C4d deposition in the graft is correlated with the lesions of transplant glomerulopathy and with circulating alloantibody (3,18,39,40). In a survey of graft biopsies that were taken 1 yr or more after transplantation, 34% had C4d in PTC (18). C4d was correlated with transplant glomerulopathy, multilamination of the PTC basement membrane, and mononuclear cells in capillaries (transplant glomerulitis). The combination of alloantibody, basement membrane multilamination, C4d, and duplication of the GBM has been termed the “ABCD tetrad” by Halloran and colleagues (41). Overall, approximately 50% of reported cases with transplant glomerulopathy have C4d in PTC (6). The Leiden group showed that glomerulopathy could occur with glomerular C4d in the absence of peritubular C4d deposition (40). Transplant glomerulopathy is strongly associated with circulating antibodies to donor HLA antigens and a poor prognosis (3). Among 28 patients with transplant glomerulopathy, 64% had circulating antibodies to donor class I (28%), II (39%), or both I and II (33%) HLA antigens (42). Patients with a positive pretransplantation cross-match have a higher incidence of transplant glomerulopathy at 1 yr in protocol biopsies (22 versus 8%) (43). Previous AHR is also a risk factor for transplant glomerulopathy (odds ratio 17.5); 44% of the recipients with AHR showed transplant glomerulopathy in a later biopsy (43). Transplant glomerulopathy has a poor prognosis, even when subclinical, as detected in 1-yr protocol biopsies (graft survival approximately 50% 3 yr after diagnosis) (43). In a series of 14 protocol biopsies that were taken 10 yr after transplantation, three had C4d deposition, and all three had circulating anti-HLA antibodies and transplant glomerulopathy (44). Deterioration of renal function was greater in the C4d+ group. Because a substantial number of cases of transplant glomerulopathy have no detectable circulating HLA antibody or C4d in the graft at the time of diagnosis, the relationship among these factors is not simple, and some have questioned whether any relationship exists (45,46). In protocol biopsies 10 yr after transplantation, six of 11 of the C4d− patients also had transplant glomerulopathy, without C4d or anti-HLA antibodies (44). In another small study of biopsies that were taken for late graft dysfunction, C4d+ PTC were commonly found in those with and without transplant glomerulopathy (four of five versus seven of 11) (47). In a comprehensive study, C4d was not correlated with transplant glomerulopathy among all patients (46). However, a closer examination of the data suggests that transplant glomerulopathy is more related to C4d than is interstitial fibrosis: Of 17 patients with transplant glomerulopathy, 53% were C4d+, versus 14% of 21 patients with diffuse interstitial fibrosis (P < 0.02). In the Vienna series, C4d deposition preceded and predicted development of the glomerulopathy (18). These data are most compatible with the possibilities that (1) alloantibodies can cause transplant glomerulopathy and C4d+ but are intermittent in action, (2) some transplant glomerulopathy may be non–antibody/non–complement-mediated (e.g., thrombotic microangiopathy), and (3) antibodies can cause graft fibrosis without transplant glomerulopathy. A fourth alternative, that alloantibodies and C4d deposition are harmless and irrelevant to late graft injury, seems improbable. We proposed that chronic humoral rejection (CHR; chronic, active antibody-mediated rejection) arises through a series of stages or states (Figure 4) (10). The serologic and pathologic evidence is most consistent with the hypothesis that the first common event is alloantibody production (stage I), followed by antibody interaction with alloantigens resulting in the deposition of C4d in PTC and possibly glomeruli (stage II), followed by pathologic changes (stage III) and graft dysfunction (stage IV) only later. 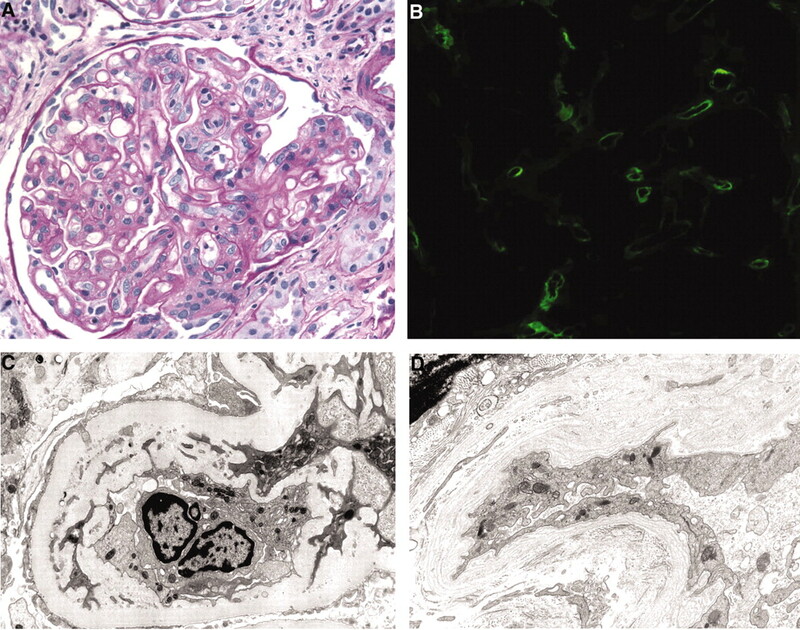 We have observed the four stages in nonhuman primates with renal allografts (48); in this setting, with no immunosuppressive drugs, progression to chronic graft injury and loss is the rule. Whether it is similarly inexorable in immunosuppressed humans remains to be determined. The level of circulating antibody may fluctuate (knowledge on this is limited), in which case stages III and IV may persist after antibody and C4d disappear (inactive stage III or IV; stage IIIi or IVi). In any case, the hypothesized stages have offered a useful organizing structure for ongoing clinical trials to intervene in the early stages (I or II). A consensus meeting at the National Institutes of Health proposed criteria for CHR (11) that have been incorporated into the Banff schema (41) (Table 3). In analogy to acute antibody-mediated rejection, three elements should be present: Histologic evidence of chronic injury, immunopathologic evidence of antibody action (e.g., C4d), and evidence of antibody reactive to the donor in the circulation. CHR is distinct from AHR in that no acute inflammation (neutrophils, edema, necrosis, thrombosis) is present. However, cellular activity is often reflected by increased mononuclear cells in glomerular capillaries and PTC. Why donor-specific antibodies elicit AHR versus CHR is not clear. Perhaps factors such as titer, avidity, and effector functions are important, as well as the resistance of the graft endothelium (accommodation). The optimal therapy for CHR is undetermined, because the natural history is unknown and drugs for long-term control of B cell and plasma cell function are not defined. Randomized trials are clearly indicated. Transplantation across an ABO barrier, which normally precipitates hyperacute rejection, has been done successfully in many centers, using special protocols to deplete naturally occurring anti–blood group antibodies. Remarkably, antibody (primarily IgM) returns in the circulation, sometimes in high titers, yet no obvious graft rejection occurs, a state termed “accommodation” (49). At a cellular level, accommodation may occur via multiple mechanisms, including internalization, downregulation, inactivation, and inhibition of the target antigen (9,10). In vitro, antibodies induce nitric oxide synthase, Bcl-2, and Bcl-xl in endothelial cells, which confer resistance to apoptosis, as well as complement-regulatory proteins, such as CD59 (10,50,51). Stable ABO-incompatible grafts show differences in signaling pathways and cytokines by microarray gene expression analysis and notably increased levels of muc-1 in glomerular capillaries (49). Accommodation in ABO-incompatible grafts is not due to a change in the nature of the antibody or loss of the target antigen in the graft, because C4d is deposited in the renal microcirculation. Protocol biopsies have revealed C4d along the PTC in 25 to 80% of ABO-incompatible grafts, with evidence of AHR in only 4 to 12% (8,52). Either the full complement pathway is not activated, or the endothelium develops resistance to its effects. A large study was designed to test whether C3d could distinguish those with accommodation from those with AHR (8). Approximately 40% of the C4d+ biopsies (14 of 37) had C3d, and C3d correlated somewhat with histologic features of AHR; however, 70% of the C3d+ biopsies also had no evidence of AHR, arguing that accommodation occurs distal to C3 activation (perhaps via inhibition of MAC). In any case, C4d deposition in ABO-incompatible grafts can be seen routinely without features of AHR and therefore is of limited value. Perhaps deposition of later complement components (C5b or MAC) or absence of heparan sulfate and syndecan-4-phosphate will show more correlation with injury, as has been reported in xenografts (53). C4d deposition also occurs in 2 to 26% of histologically normal ABO-compatible grafts, the higher frequency found in HLA-presensitized patients (8,54) (Figure 5). In these patients, incidental C4d deposition does not necessary portend AHR; however, it may not be entirely benign. Among 17 patients who had C4d in PTC without histologic evidence of AHR or acute cellular rejection and who received no increased immunosuppression, graft loss at 3 yr was 32% compared with 0% among five patients who were treated with increased immunosuppression, suggesting that incidental C4d may represent a “smoldering rejection” (55). Accommodation may have different degrees of effectiveness and stability, ranging from none (hyperacute rejection), to minimal (acute rejection), substantial (chronic rejection), or complete (stable accommodation). The minimal features that indicate transformation from accommodation to rejection have yet to be defined. For example, if the capillary endothelium is reactive by electron microscopy (loss of fenestrations) or if the GBM has mild segmental duplication, then does that change the diagnosis or the prognosis? The outcome will probably be determined primarily by the course and the pathogenicity of the alloantibody response itself. Even in ABO-incompatible grafts, accommodation may be incomplete: Transplant glomerulopathy is more frequent in 1-yr protocol biopsies of ABO-incompatible grafts than in ABO-compatible recipients (13 versus 8%) (43). Controlled trials and further follow-up will be needed to interpret the long-term significance of “incidental” C4d deposition (Figure 5). The effects of antibody and complement on the endothelium range from lysis to activation, including production of growth factors, adhesion molecules, cytokines, and chemokines (10). Complement fixation is strongly associated with the ability of antibody to mediate AHR in animal models (56) and in humans (57,58). Recipients with anti-donor HLA class I antibodies that fix C4d to FlowPRA beads had inferior graft survival compared with those that did not, the latter having a similar outcome to patients with no anti-donor antibody (57). Complement-dependent cytotoxicity was also predictive of poorer outcome. Of note, complement-fixing HLA class II antibodies did not affect graft survival, even though they were associated with C4d deposition. Anti-donor antibodies of the strong complement-fixing subclass IgG3 were present in three patients with acute rejection but not in stable patients, whereas the latter had a significant rise only in the non–complement-fixing IgG4 subclass (58). In mice, non–complement-fixing IgG alloantibodies are associated with graft acceptance but can also activate endothelial cells to produce chemokines and promote rejection (56). Direct linkage of circulating antibodies and chronic graft pathology was shown in experimental studies in which passive transfer of MHC antibodies could initiate the chronic arterial lesions in mice. Immunodeficient scid or RAG−/− mice that were given repeated doses of anti–class I alloantibodies developed fibrous intimal thickening of coronary arteries in cardiac allografts over 1 to 2 mo and C4d deposition in the capillaries (59). In vitro anti–MHC class I antibodies promote endothelial proliferation via increased expression of basic FGF receptors, increased phosphorylation of Src, and NF-κB levels (60). Anti–class I antibodies increase endothelial resistance to apoptosis, as manifested by increased Bcl-xL, Bcl-2, and HO-1, and increased activity of phosphatidylinositol-3-kinase and Akt pathways and resistance to complement-mediated lysis (50,51). Anti–MHC class II antibodies also stimulate endothelial protein kinase C and Akt activation (61). S6 riboprotein (S6RP) is phosphorylated via the Akt pathway and is increased by either class I or class II antibodies (15). Some of these effects can be appreciated in vivo by study of biopsies. In human cardiac grafts, C4d deposition is correlated with microvascular expression of phosphorylated S6RP as detected by IHC (15). Curiously, increased S6RP was associated with antibodies to class II but not class I MHC molecules. Are all antibodies pathogenetic? In some experimental settings, antibody can even promote graft acceptance (enhancing antibodies). One might predict that the “benign” antibodies would be deficient in their ability to fix complement or bind to Fc receptors (e.g., IgG4). IgG4 anti-donor HLA antibody is increased in recipients with long-term graft function (58). IgG4 does not fix complement and may inhibit immunologic injury. Avidity and titer also are probably major determinants. In the literature, there is little evidence for benign antibodies, provided that they react with donor HLA antigens. Until convincing evidence is reported, the default position is that development of donor-reactive HLA antibodies and/or C4d deposition should trigger a heightened state of clinical vigilance. The detection of C4d deposition in capillaries of allografts has permitted the definition of two new forms of antibody-mediated rejection, acute and chronic, as well as an apparent clinicopathologic state in which the endothelium undergoes no obvious pathologic change (accommodation). Now that these conditions can be diagnosed reliably by the pathologist, randomized clinical trials can be initiated to ascertain the optimal therapy and prevention.